for swimming pools and spas ! The universal pre-filter for skimmer! The absorber of oily substances ! Net’Skim® is a disposable, hygienic pre-filter for skimmers which makes basket maintenance easier and protects the pump. The double fixture system; fastener and elastic, allows for simple installation and maximum efficiency. Water Lily® is a selective absorbent of oily substances which purifies thus protecting against unsightly waterlines. Manufactured from specially treated microfiber material, it is placed in the skimmer basket on the water’s surface thus absorbing and retaining oils, suntan creams and atmosphere pollution residue. 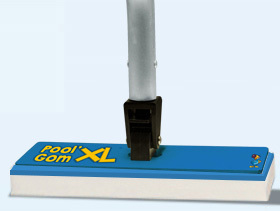 The New Pool’Gom XL®is an extra large, multi-surfaced, magic eraser which efficiently cleans stubborn stains and marks on the sides, bottom and waterline of your pool. 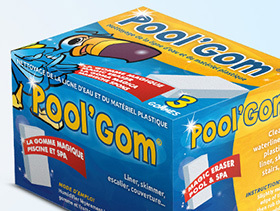 Easy Pool’Gom®, magic and practical! 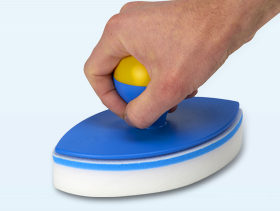 Its ergonomic grip makes cleaning easier and is a particularly efficient eraser for cleaning the waterline.